A fun colorful rubber dog ball toy with TWO openings where you can stuff it full of your dog's favorite chew or snack,and they'll work at it for a long time to get every last snack out of there as well as having a good healthy chew at the same time whilst cleaning their teeth simply. The specially designed ball with variable rubber extensions and textures will maximize teeth cleaning by removing the plaque and tartar from their teeth and massaging the gums at the same time without any fuss and hassle. 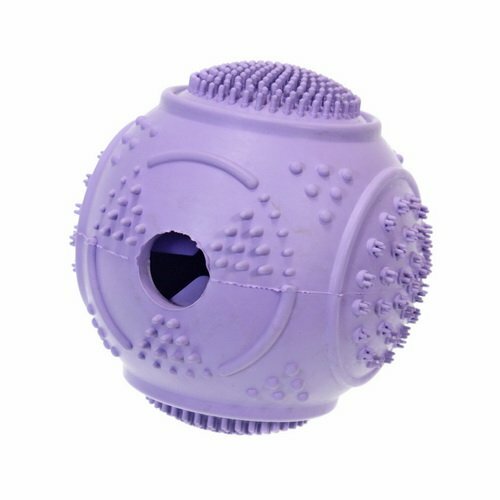 A bored dog can be very destructive particularly if they don't get as much exercise as they would like so you can also toss it around for fetch or get it out when distraction is required and let your pet chew safely with this tough, durable and strong dog treat ball toy. Perfect for those dogs who love tennis balls and exercising. Also an excellent alternative to traditional bowl feeding extending the joy of mealtime and preventing unhealthy gulping, by slowing down your pets eating speed thus helping with any weight management issues. It is made of non-toxic, extremely durable natural rubber. An ideal gift for any occasion especially, Thanks Giving,Christmas, Easter, Independence day or a birthday for your loving, faithful best friend. SUITABLE FOR SMALL AND MEDIUM SIZE DOGS ONLY. ALTHOUGH, THESE TOYS ARE SERIOUSLY STRONG, THEY ARE NOT INDESTRUCTIBLE SO WE CANNOT GUARANTEE AGAINST VERY STRONG DOGS BREAKING THEM. If you have any questions about this product by Petdentist, contact us by completing and submitting the form below. If you are looking for a specif part number, please include it with your message. Romp-n-Roll Ball Dog Toy Color: Blueberry, Size: 8"